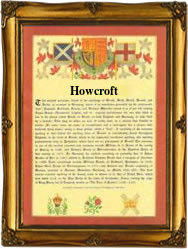 Recorded as Hawcroft, Howcraft, Hocroft, Howcroft, Howcrofts and possibly others, this interesting surname is English. It is locational and according to the famous Victorian etymologist Canon Charles Bardsley writing in 1880, derived from a place called Havercroft near Dewsbury in West Yorkshire. During the Middle Ages, it became increasingly common for people to migrate from their birth place to seek work, and the custom developed that they would adopt, or be given, as a means of identification the name of their original home. This often resulted in a wide dispersal of the name, and given that spelling was at best indifferent, and local dialects very thick, soon lead to the development of alternative spellings. The origination of this name is from the pre 7th centuryScandinavian word 'haugr' meaning a hill or burial barrow, with the Olde English 'croft', meaning a small holding. Two early recordings are those of Kathren Howcroft on the 11th April 1635 at Leigh in Lancashire, and in the city of London, George Hawcroft at St James Westminster, on November 15th 1783. Surnames became necessary when governments introduced personal taxation. In England this was sometimes known as the Poll Tax. Throughout the centuries, surnames in every country have continued to "develop" often leading to astonishing variants of the original spelling.